The 2018-19 split round of the 2018-19 A-League season was another exciting one, so let’s go straight into the talking points from Round 10. 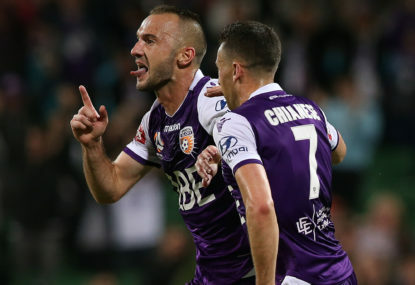 The match-up between Central Coast and Perth on New Year’s Eve was not supposed to be that eventful a match, and though the result from the team on top of the table playing at the home of the team at the bottom was fairly regulation, it was anything but a mundane affair. But if there’s one thing that the A-League continues to do with a frequency and regularity as perfect as a Swiss timepiece, it is surprise. Granted, I didn’t watch the entirety of Monday’s game, but it was impossible not to be grabbed by Tweets like this. We have an extended delay in Gosford because the goal is broken. And that was only the beginning. As the match progressed a small child was shown carrying a toy machine gun, although reports have not yet confirmed it to be a ‘toy’, with more likely reports being that the poor boy was actually trying to fight his way out of the stadium. 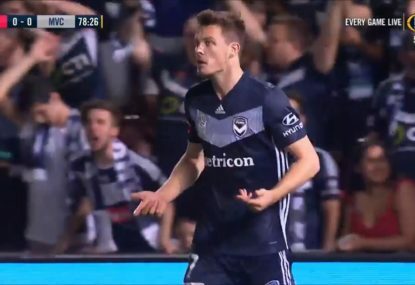 The entertainment only got better when Daniel McBreen, unaware that (a) his microphone was still on and (b) the YouTube telecast was not yet cut, turned the air blue with his assessment of the Mariners. All that by half-time, and while the second half was less interesting, it was not without interest, with fireworks going off mid-game. To top off the whole evening, it was later revealed that a portion of the Gosford Stadium was quarantined to protect an endangered bird that was nesting there. To quote one social media user on New Year’s Eve, the game in Gosford truly was peak A-League. Our little league has had a rough trot the past season or two, yet it continues to survive, and while it may not be the best league going around, it is still ours, and for the moment I wouldn’t have it any other way. 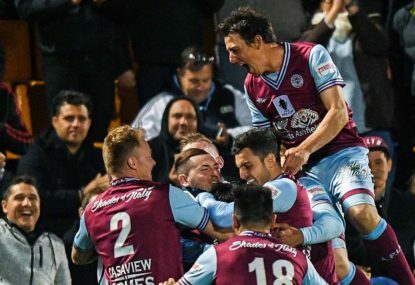 It made perfect sense that the A-League would finish the 2018 calendar year in the manner that it did – 31 December 2018 could not have been any more A-League if it had tried. I’ve consistently sung the praises of Wellington Phoenix’s Mark Rudan over the last few weeks, and even though his team’s winning streak came to an end against Victory, dropping points against the reigning champion is nothing to be ashamed of – in fact taking away a point from the home of the reigning champion is a huge feat and something that would have been far out of Wellington’s reach in seasons past. The Phoenix appear to be here to stay for 2018-19, and it’s been a refreshing change that’s allowed us to highlight the good job Rudan is doing as a coach. It’s also been fantastic for him to use his current platform to promote the quality of coaching coming out of the NPL ranks. Though there are loads of coaching opportunities in Australia, there are only ten head coaching opportunities in the A-League. Each club is always looking for that winning edge, and part of that equation is finding a quality coach. As Mark Rudan has shown, a good coach can come from anywhere, but it is nice of him to remind anyone who will listen that sometimes the best coaches are right in front of you. 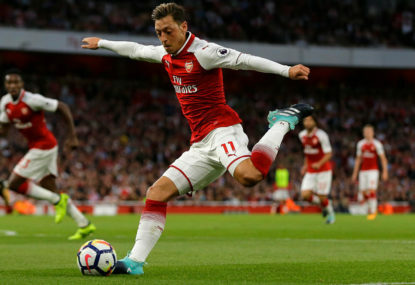 I’ve said it before, I will say it again now, and no doubt I will say it at least once more this season – you simply cannot overstate the value of a good striker. Yes, defence can win championships – after all, if you don’t concede, you can’t lose – but if you don’t score, you can’t win. During commentary of the Sydney FC vs Brisbane game on Saturday one of our Roar commenters, Stevo, said: “So having a striker on your team worthy of the title striker was the difference in this game”. 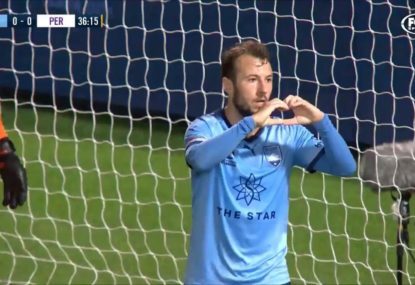 Adam le Fondre, the Sydney FC striker, took his chances against the Roar, who were reeling from the departure of their coach some 24 hours earlier, while up the other end a deflected goal off Matt McKay’s chest was all Brisbane had to show for their toil. Though Brisbane’s Adam Taggart earnt what I appreciate was technically a penalty – though I think it shouldn’t be classified as a penalty – he could not finish his spot kick, and his side, which was probably deserving of something, went back to Queensland with nothing. Strikers – they may well be the reason Sydney have another tilt at the title and the reason Brisbane are looking for another coach. All is not well in the Hunter. Coming up against Adelaide, who were coming off the back of a short turnaround from a hot match at home, Newcastle should have had their own home game in furnace-like conditions wrapped up at half-time. Instead they found themselves 1-0 down at half-time. 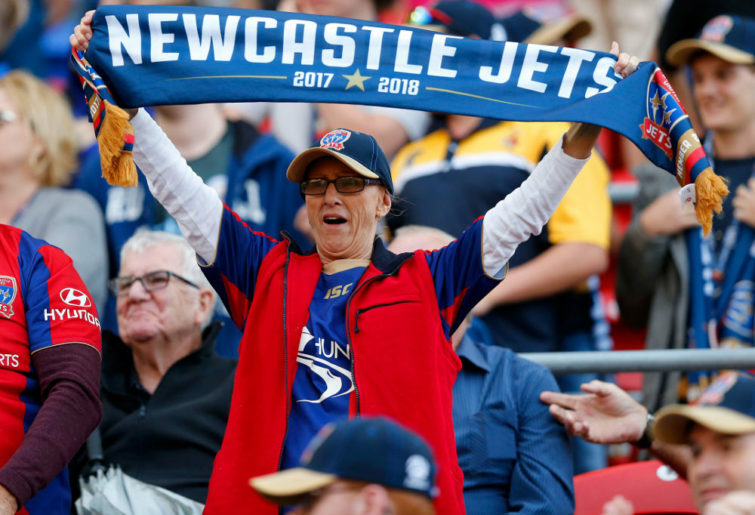 While the result doesn’t reflect it, the Jets are arguably playing football as well as they did last season when they made the run to the grand final. The difference this season, however, is that they are not as assured at the back, and boy oh boy are they failing to take their chances. It looks from the outside as though they have not yet recovered from the triple blow of losing Andrew Nabbout to the Urawa Red Diamonds, Joe Champness to injury and Roy O’Donovan to suspension. O’Donovan is now back and scored against Adelaide, but that was a long time he wasn’t playing, and he’ll need more time to get back into the rhythm of playing with new faces. Meanwhile Dimitri Petratos is having second-season blues in Newcastle, Ronald Vargas is running hot and cold and new faces Mitchell Austin and Matthew Ridenton have not yet met expectations. 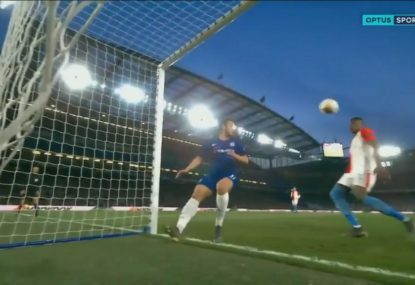 Throw in things like Lewis Italiano’s howler in the goals that led to the opener and Nigel Boogaard’s sliding challenge to give away the losing penalty and it’s not a pretty picture. Mind you, Newcastle won against Adelaide in Newcastle last season on a last-minute dubious penalty, so Adelaide in some way might think that this was justice or karma. Newcastle should have won against Adelaide both because of a fatigued opponent and because of the general play during the game – but they didn’t. Those types of showings and outcomes do not bode well for the remainder of the season. Whatever you think of Warren Joyce’s coaching – and I’ve been critical of him this season – one thing that he obviously can do is build structure and a solid defence. With a settled back four of Scott Jamieson, Harrison Delbridge, Bart Schenkeveld, and Ritchie De Laet and the linchpin between the sticks in Eugene Galekovic, Melbourne put in a defensive performance against Western Sydney that at times looked impenetrable. 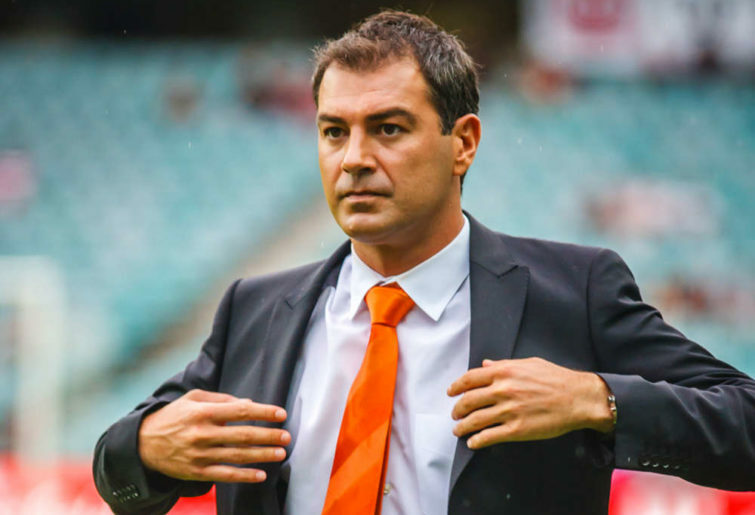 Granted, Galekovic put in a superhuman effort against the Wanderers, saving point-blankers and a penalty, but even then his defence had to earn their oranges as well. As I said, you need strikers to score your goals, but you can’t throw the baby out with the bath water, and that defence has to be sound. Joyce has some work to do in Melbourne to get his squad up to championship calibre, but one thing he doesn’t have to worry about is getting his defence to work – it’s very much already doing that.